On a recent trip to Charlotte, NC our hosts, Eric and Mike (the awesome guys behind this project), took us on a wine tasting tour through the Yadkin Valley. Before we left for our adventure, Eric recommended we stop by the supermarket to pick up pretzels to make an edible necklace with. 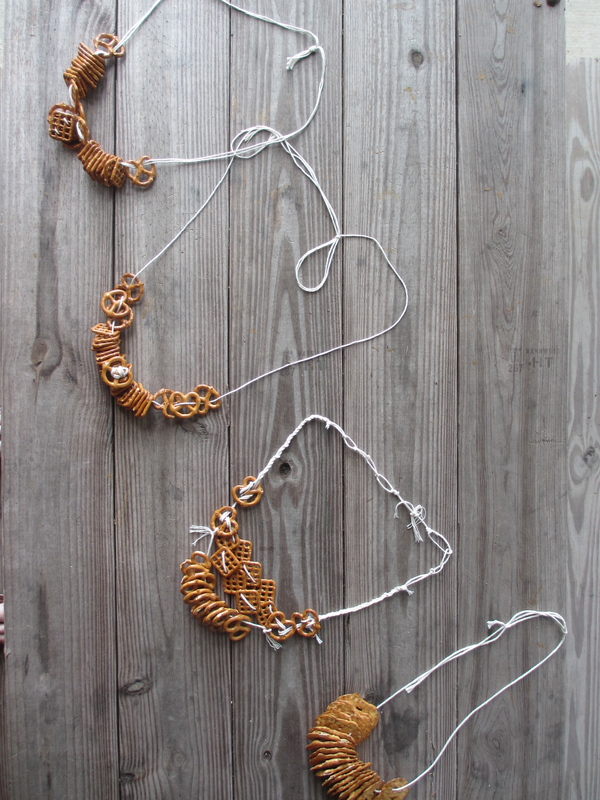 Sort of like a candy necklace, but with a salty snack instead. Sure, the idea sounded a little kookie, but we were up for anything. I have to admit, this clever little project took me by surprise for more than one reason. First, designing and creating the necklaces gave everyone (except the driver) something interesting to do in the car on the drive. Second, it allowed us to have our own tasty snack at the ready while we were tasting wine. Third, we didn’t have to munch on stale oyster crackers that every other guest that had visited the winery that day dipped their hands into. While Brian and Mike were a bit sceptical of their new accessories at first, they quickly saw the benefit of having a snack right their around their neck. And at each stop, more and more strangers seemed to love the idea, commenting on how they wish they had one, too. To make your own, you just need natural cooking twine, scissors and pretzels (we had a mix of Rold Gold Tiny Twists, Snyder’s Butter Snaps and Pretzel Crisps). Use your imagination to create a design that’s right for you, tie it around your neck and enjoy. Don’t worry what others might think, after all, you’re likely to be a bit tipsy from the wine you’re sampling. SWWU TIp 1: Stay away from flavored pretzels as they might stain your clothing. Also be careful of salted varieties snagging silk or other delicate fabrics. SWWU TIp 2: This would be an excellent activity for a group going on a wine tasting tour for a bachelorette party or wedding shower. This entry was posted in For Our Friends and tagged @SWWUblog, bachelorette party, DIY, edible accessories, edible necklace, for our friends, necklace, pretzel, snack, wedding shower, wine tasting, wine tour, winery, Yadkin Valley by Something We Whipped Up. Bookmark the permalink.